Welcome to Vintage, the industry leader in Ventilation Technology and Innovation. Prestige has assembled a team of professionals with over forty years of experience in product design, manufacturing and marketing. This dedicated team has developed a full line of the highest quality, commercial-grade ventilation systems for your home. Prepare all of your favorite drinks with ease and style on a Vintage™ Bartending Center. 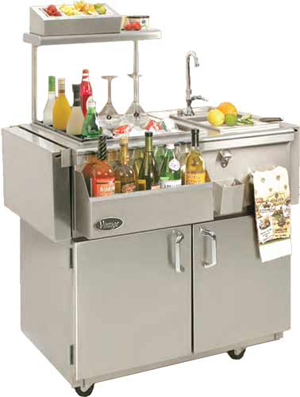 These units were designed by bar professionals to offer all the features you need to mix, shake, stir and chill. All heli-arc welded 304 series stainless steel for durability. Insulated ice bin with divider and chilled bottle wells. Sink with cutting board for easy prep work. Professional speed rail for easy access to frequently used bottles. Three different models available to fit any size yard. 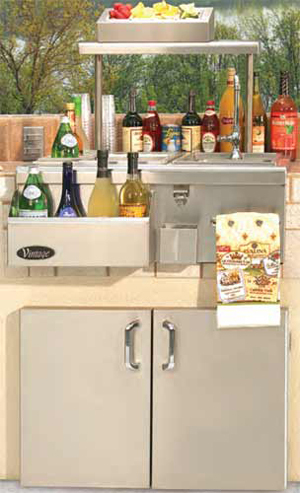 If you are tight on space, this 14" wide bartending center is just right. Features include an all stainless steel sink, ice-bin, and speed pour rail. VDT-14G (shown above). Also available: 30" wide model featuring super-capacity ice bin, 4 bottle wells, speed rail, bottle opener and towel ring. A Vintage™ Refrigerator brings you a new level of versatility and convenience to outdoor cooking, saving you trips back and forth between the grill and the house. Keep meats, fruits, vegetables and beverages ice cold in any weather with one of our commercial-grade refrigerators. Quiet-running, high efficiency, front vented compressor with 5 year warranty. Efficient, balanced refrigeration system is self-contained and requires no plumbing. Two inch foamed-in-place insulation saves on energy costs and adds strength. 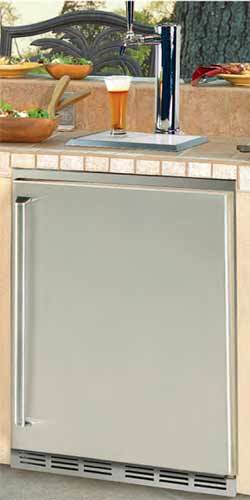 Reversible doors allow door swing from left to right as desired. 110V single phase 15 amps. No drain required. 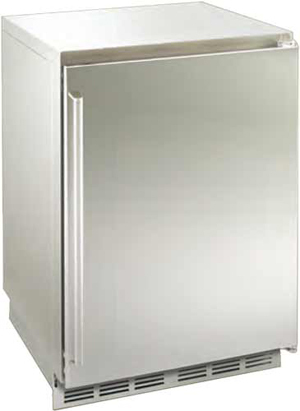 Complete your outdoor kitchen with a UL approved outdoor rated refrigerator beer tapper from Vintage.With a high efficiency commercial compressor and evaporator, this versatile undercounter refrigerator is the optimum way to keep cold drinks handy. And when you really work up a thirst for something frosty, just pull the tap on the beverage dispenser. This unit is constructed of stainless steel both inside and out and has vinyl coated adjustable cantilever shelving to match your cooling needs. The stainless steel door is self-closing and reversible allowing it to swing from either the left or right, as desired, and opens wide for easier keg access. Two-inch thick foamed-in-place insulation saves on energy costs and adds strength making this an ideal addition for your outdoor entertaining.